Summary: The life and career of Broadway and film start Judy Holliday in 90 minutes. Highlights: It takes a smart person to play dumb, and that was Judy Holliday, whose career was cut short by cancer. Her iconic performance in Born Yesterday (on Broadway and in the movie, for which she won an Oscar) as the stereotypical dumb blonde chorus girl who's smarter than you think kick-started her career in the '50s. This play with music takes place in a recording session as Judy is waiting for news from her doctor (spoiler alert: it's not good), and then flashes back for a whirlwind tour through her life. Her insecurities about her weight, looks, and voice, her involvment in McCarthyism (during which she once again played the role of the dumb blonde), her family and relationship troubles, all are chronicled in 90 minutes, sprinkled with some of her most popular songs (a few of which she wrote). It was a wonderful way to get to know this smart and talented women I previously knew little about. Andrea Burns is fantastic as Judy, playing the dumb blonde role (in a scene from Born Yesterday), the intelligent career woman, and the vulnerable human. Just three other actors (Mark Lotito, Andrea Bianchi, and Jonathan Spivey, also playing the piano) play all of the other characters in her life, and manage to create many distinct characters (including her friends Betty and Adolph and their pianist friend Lenny) in a short amount of time. 59E59 Theater (located at 59 East 59th Street, natch) houses three theaters and was a busy place on a Friday night. The theater space in which Smart Blonde is performed is a cozy intimate space (barely meeting the 100-seat Off Broadway criteria), the stage decked out like a recording studio, the voices of the performers needing no amplification. 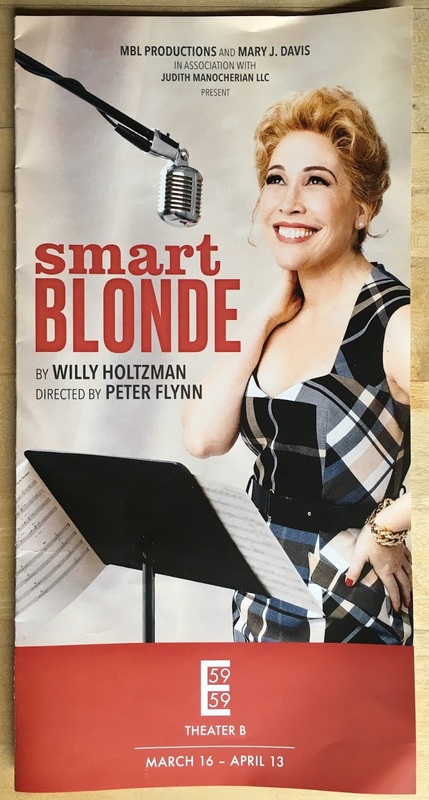 Smart Blonde is a great off-the-beaten path choice, especially for fans of Judy Holliday, or those who will become fans after seeing this show. I'm hoping this play is presented in Mpls, possibly at the Jungle. I've always been a fan of hers and believe she was a gift from the gods. We are fortunate that her film performances: Adam's Rib, Born Yesterday, It Should Happen to You; Phffft! and Bells Are Ringing are available so her memory will always be preserved. I would LOVE to see this in #tctheater! the Jungle would be a great choice.